Today I received a package of 30 Diamine inks. 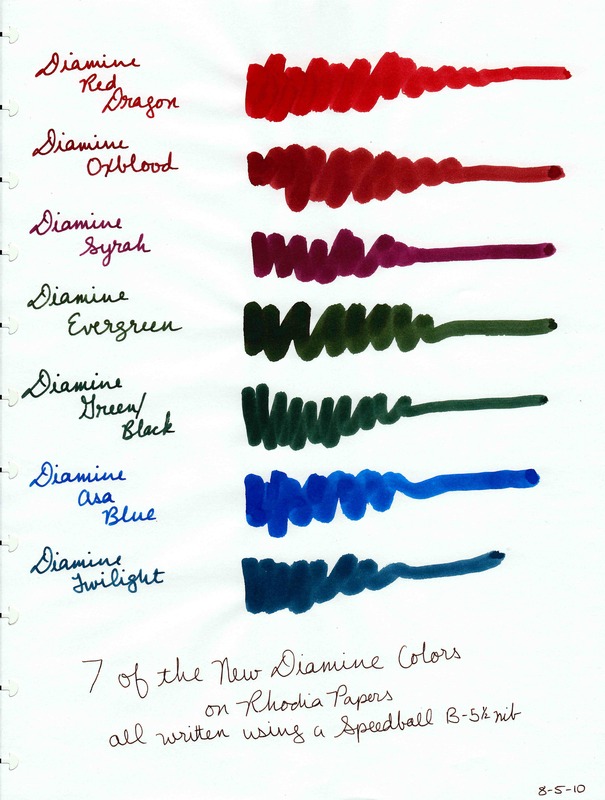 In that package was 7 of the 8 new Diamine colors. Since I know several people are anxious to see what they look like I quickly swabbed and dip tested each one. There will be full length reviews just as soon as I can manage it. My favorite so far is Asa Blue. These samples were sent to me by the good folks at Diamine. I am not otherwise affiliated with them. Wow…great colors! I love the Syrah! Thanks for this Dizzy! A lot of people are excited about these new colors. They should be landing in the US here in the next few weeks to be available through US retailers. I can’t wait to test them for myself! Lucky dog!! Hey Diamine – I’ll take some ink!! LOL! I don’t know that darker is the right word. Evergreen has a higher saturation and is therefore richer than Green/Black. Evergreen, however, has a brightness to it. Green/black has something more gray/muted/vintage about it. I’ve never seen either ink “in person,” but that Asa Blue resembles on-line depictions of Noodler’s Baystate Blue. Perhaps it could be a viable substitute for those not willing to put up with the staining of Baystate Blue? I don’t have a lot of experience with Baystate Blue but I can tell you Asa Blue is not nearly as vibrant as BSB. I’m not sure it compares well.